That’s how Walter Barrientos, Make the Road organizer and longtime leader in the immigrant rights movement, described the Trump Administration’s recent termination of the Deferred Action for Childhood Arrivals (DACA) program. 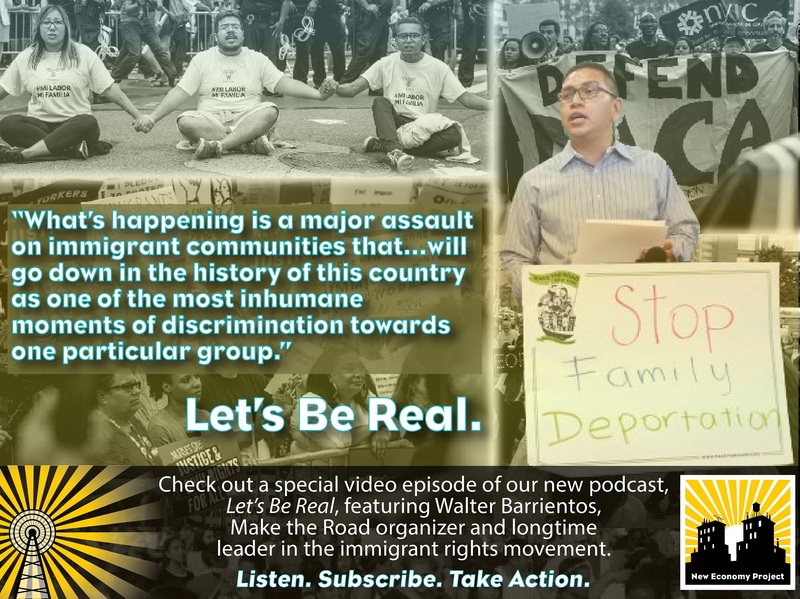 In the latest episode of our podcast, we speak with Walter and other New Yorkers about this attack on immigrant communities and why it is so critical that people take to the streets and demand justice. Donate now to help cover DACA renewal fees. New Economy Project’s DREAMer Fund, is providing rapid-response grants and 0% interest loans to New Yorkers facing the October 5 deadline to renew their DACA. Call your Congress Member to demand they pass the DREAM Act to protect all DACA beneficiaries. Sign the petition created by United We Dream urging Congress to protect immigrant youth. Hosted by Juleon Robinson | Produced by Sarah Ludwig & Juleon Robinson.